This is a place to share healthy recipes that you try or use this year. 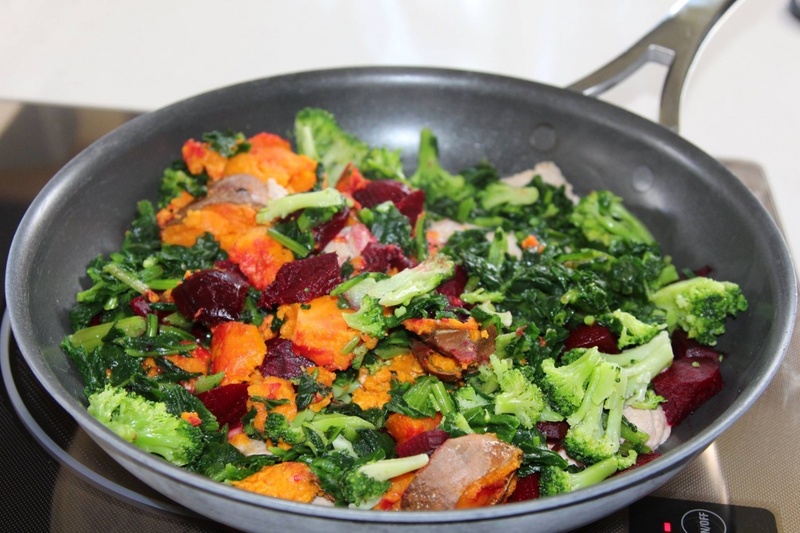 When you post please write why you consider your recipe to be healthy. Is it low calorie? Low fat? Low carb? Other nutrition information is helpful, if you know it. Let's have a happy and healthy New Year! This should be a good place to stash healthy recipes. Place all ingredients in Crock Pot and cook on low 8 hours or till veggies are tender. Leftovers will freeze well. This is a go-to for me when I really need to lose weight. It's good comfort food, but mostly veggies, therefore low in calories. Almost anything chicken due to low saturated fat/low cholesterol is my new year menu. I had switched to beef in 2018 as I was tired of chicken and my cholesterol went up a lot. So, back to chicken! I bake a chicken breast with marinara sauce on top and it tastes like chicken parmesan to me. Just add some pasta. I'd say it's low cal, very low fat and great taste. I also buy a pizza dough from the deli and roll it out to layer cooked chicken, fresh onions, fresh mushrooms and some part-skim mozzarella (not a lot) cheese. NO sauce as that makes it very soggy. The sauce can be on the side for dipping, though. Again, it's a fairly low cal/low fat/low chol meal. Rujerro, we eat a lot of chicken and fish for the same reason. Also turkey, I can get it ground for chili and burgers, or made into sausage or kielbasa for a change of pace. If you pre-bake the pizza dough ~10 mins before adding toppings it is less likely to get soggy. Lot of good ideas in this article. I like that you cook ahead a few things to eat throughout the week, so you are not doing it all from scratch every night. The sheet pan chicken and roast fish with vegetables look tasty and easy. One of my favorites. Any type of ground meat (I like grass fed and finished beef or free-range turkey). Fresh beets baked first, then added to a stir fry with some other veggies and a little coconut oil. I used to make this all the time and took a picture. This one had baked sweet potatoes and other greens. I'm alone so this meal would last three days. Nutrient dense. Company loved this one. 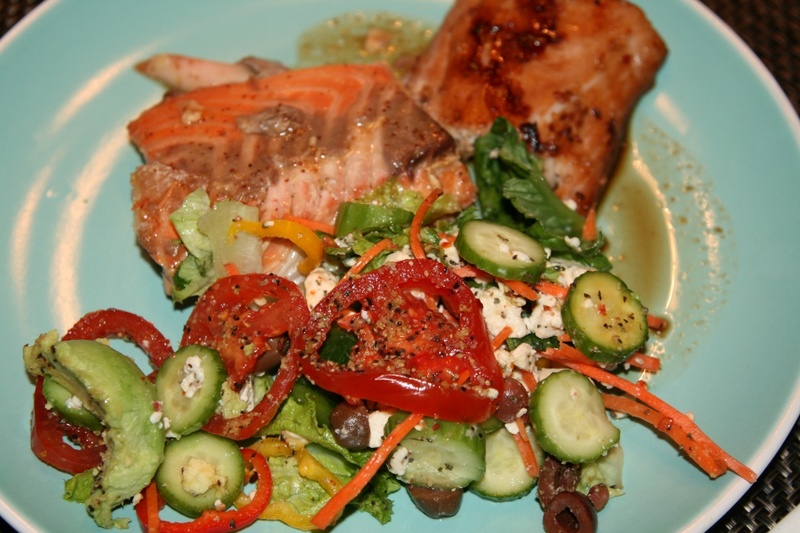 Wild salmon with a simple salad. I made my trusty taco seasoning mix today. I've used this recipe for probably 35 years. The only ingredient containing salt is the chili powder, so it's not only a lower sodium food, but flavors other than salt are more evident so it tastes better than the store stuff. I usually use 99% fat free ground turkey to make tacos to cut fat. Last time I used very lean beef, the turkey, and added a can of kidney beans for less fat and cholesterol per serving. Mix well and store in tight container. To use, brown meat, drain if needed, and add 2 T. seasoning mix and 1/2 cup water. Simmer 10 minutes, stirring occasionally. SD - just for clarification: that's a 48 oz can of tomato juice in the cabbage soup, correct? Dang! Yes, 48 oz. I did proofread but missed the omission. Sorry. Tell us your get healthy story- I am starting to eat healthy and want to hear it! What is your favorite frugal healthy snack? LFL Club: Favorite healthy foods?